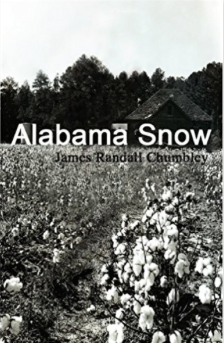 Artist and writer James Randall Chumbley comes out of hiding after three years since his last bestseller with his most revealing book ever, "Alabama Snow." The author has written a tender, heartbreaking story of how his mother lost her dreams — growing up poor, the daughter of a sharecropper cotton farmer in rural Alabama — and his attempts of trying, for years, to save her from mental illness and alcoholism. Plus, his own struggles with facing the break-up with who he believed, at the time, was the love of his life; whom he met just a month after his mother’s death. It almost almost pushed him to suicide. Find out how a message of hope from her saved her beloved son from meeting the same end as his father. Anyone whose life has been touched by mental illness will find something worthwhile in this narrative. James has opened his heart and soul, holding nothing back for the reader. ATLANTA, October 2, 2009 - Local artist and author James Randall Chumbley will read from his new book, Alabama Snow, at a benefit for YouthPride’s suicide prevention program known as Evolve! The event will take place at Outwrite Bookstore & Coffeehouse on Wednesday, October 14 at 7:30 PM. This special fundraising event is also being staged to raise community awareness of the risks of suicide among lesbian, gay, bisexual, transgender, and questioning (LGBTQ) youth and young adults in metro Atlanta. Chumbley will be donating to Evolve! his portion of the proceeds from all copies of Alabama Snow sold at Outwrite during the month of October. Chumbley is also donating one of his original mixed-media contemporary landscape paintings, valued at $3000.00, which will be raffled off to benefit Evolve! Raffle tickets are available from October 7 -14 for $5.00 each at Outwrite, where the art will be on display. The winning ticket will be drawn during the October 14 event. Having survived his own attempted suicide earlier this year, Chumbley is finding new strength after a long struggle with depression by speaking out publicly. He plans to use his art and writing, and the release of his new book, as instruments of hope and support to individuals and organizations battling issues of suicide within the LGBTQ community. As he embarks on his book tour for "Alabama Snow," Chumbley will host similar book events across the country, each benefiting local market LGBTQ suicide prevention programs. At Outwrite, Chumbley will be reading excerpts from "Alabama Snow," which touches on depression and suicide, but is mostly the story of his mother's life: her hopes and dreams as a young girl, the abuse and violence she experienced at the hands of her husband, her struggles with mental illness exasperated by that mayhem, and the suicide of Chumbley's father when he was seventeen. He will also be frankly discussing his recent suicide attempt. YouthPride representatives will be at the event to provide information about services for LGBTQ youth and discuss the impact of suicide on the gay community. Individuals attending the event will also be able to make donations directly to YouthPride. According to a 2006 study by Eisenberg and Resnick, lesbian, gay and bisexual students (grades 9 – 12) were significantly more likely to have attempted suicide than their heterosexual peers. The research noted that 52.4% of lesbian and bisexual females and 29% of gay and bisexual males had attempted suicide. Such statistics highlight the growing concern of suicide among LGBTQ teenagers and young adults, which led to the creation of YouthPride’s Evolve! program. The program offers therapeutic services to youth in crisis, including free non-judgmental and confidential counseling for YouthPride members, provided on site by licensed practitioners and counseling interns. James Randall Chumbley, known to his friends as Randy, is a nationally respected artist, author, and activist who divides his time between Atlanta and Los Angeles. "Alabama Snow," is the tender yet heartbreaking story of a woman, Chumbley’s mother, who lost her dreams. The author recounts his years of struggle to save his mother from mental illness and alcoholism; the very reasons he put off his dreams of California and remained in Georgia after college. He also shares a little about his emotional break-up with who he wrongly believed, at the time, was the love of his life, a man he met shortly after his mother’s death, whose psychopathic actions, unknowingly to Chumbley at the time, pushed him to the brink of suicide. Find out how a mother’s message of hope from beyond the grave saved her beloved son from ending his life as his father had done. Anyone whose life has been touched by alcoholism and mental illness will find something worthwhile in this narrative as Chumbley opens his heart and soul, holding nothing back from the reader. Read an excerpt from the book on the author’s Web site http://jamesrandallchumbley.com/alabamasnow.aspx. Chumbley’s first book, a memoir entitled In the "Arms of Adam: a diary of men," met with immediate critical and professional success. This deeply passionate, sensitive, and raw personal story that chronicles his tumultuous and painful childhood filled with his father’s abuse, alcoholism, eventual suicide, and his mother’s mental illness through the self-discovery he experienced as a young man. His second book, "Before the Last Dance," is a novel but perhaps more truth than fiction. It explores the issues of growing up gay, finding oneself, and coming to terms with the aging process – all in a community that covets youth, vitality, and appearance. You can learn more about Chumbley’s writings at www.jamesrandallchumbley.com. Chumbley is also known for his visual art which encompasses contemporary landscapes, abstracts and nudes using the media of oil, wax and varnish. His work is on display in numerous galleries and is included in many high-profile private and corporate collections across the country. Learn more: www.jrchumbleyart.com. YouthPride (www.youthpride.org) protects, unites, and dignifies the lives of gay, lesbian, bisexual, transgender, queer and questioning youth and young adults. YouthPride provides a safe, comfortable space where youth can conduct support and discussion groups, plan youth-led workshops, utilize library and computer resources, attend social gatherings, or explore educational and career opportunities. It is metro Atlanta's only Lesbian, Gay, Bisexual, Transgender, Queer and Questioning (LGBTQQ) organization dedicated solely to the needs and interests of youth. For more information about the Evolve! program for suicide prevention and counseling, contact Tana Hall, LPC at 404.521.9711 ext. 207 (Tana@youthpride.org). Outwrite (www.outwritebooks.com) is an independent bookstore and coffeehouse located at the corner of Tenth Street and Piedmont Avenue in midtown Atlanta. Opened in 1993 by owner Philip Rafshoon to serve Atlanta’s gay & lesbian community, Outwrite has grown quickly to become the largest GLBT landmark in the South, known worldwide for signature events featuring emerging writers and literary superstars. Outwrite has been named “Atlanta’s best bookstore” by Southern Voice. She sits at a quaint bistro table on the narrow sidewalk. The aged unleveled concrete is wet from the hosing by a muddled-haired restaurant employee, wearing a crisp red apron embellished with the establishment's logo — 103 Café — in a cream color, dead in its center. It is a luminous, late morning, close to lunchtime. Her back is to the eleven o'clock sun to keep it out of her sensitive eyes. The back of her pale neck and arms, exposed by the short-sleeves of her green flower-print dress, are warmed by it. The air smells clean as she takes a deep breath without being aware of its intensity. Her lungs expand and then discharge the spent air. She considers pulling a cigarette from the generic, half-emptied pack positioned on the table close to her glass of white wine, but keeps her hands in her lap. She is distracted for a moment from the calming thought of a cigarette by an odd-looking man leisurely riding past on a junky bicycle. He smiles at her and signals with the bell on the handlebars. To her, he looks likes a circus performer, but he is not. He is just an odd-looking man in mismatched clothes. If you have read "Alabama Snow" then please go to amazon.com or barnesandnoble.com to write a personal review of your thoughts on the book to share with others. I've just finished your book this week and I cannot tell you how much I empathize with the horrendous mental anguish that you have suffered; God bless you! My story is somewhat similar except it is my only son who suffers from chronic bipolar disorder. In the past ten years I too have gone through periods of desperation and wishing that it "could all be over." The love and care you showered on your Mother is so unusual and very, very special. Most children estrange themselves from parents who suffer addiction and mental illness--which is what your brother did! You are indeed a rare human being, although we all pay a price for immersing ourselves in a loved one's illness. The book opened my heart and my mind. It's the story of a man's love and respect for his mother. Everyone should read it, in my opinion, many of us loose sight of the love we received from our mother in the good times and bad times. I cried from the beginning until the end. The author gave us a wonderful transition of his mother's youth to now for a better understanding of what made her who she is. There is no guessing; clearly he walked you through his life disclosing many of the happenings in our own life that we hide away. Again, the author's choice of words, as in his other books, pulls you into his world. It is impossible to not feel hurt, anger and love. Yes, it is another of his books that stays with you for a long time and in a mode of comparing it to your days with mom. Thank you again for another great work and for sharing it with us. This book is an honest, yet loving tribute from a son to his mother. “Alabama Snow” is the story of Mary Rushing Chumbley, a woman who traveled a painful path in her life. The son, author James Randall Chumbley, is a gifted writer and talented artist. Perhaps that's the reason why his words paint such incredible mental pictures, drawing the reader into the moment. Readers are able to visualize, and to feel this story. Chumbley reaches into the depths of his family dynamic and pulls out his "DNA demons" with amazing courage. No pity party about family dysfunction, mental illness, sexuality, “Alabama Snow” is about the direction we have taken in our lives. It's about death, yet it teaches us so much about love and life.